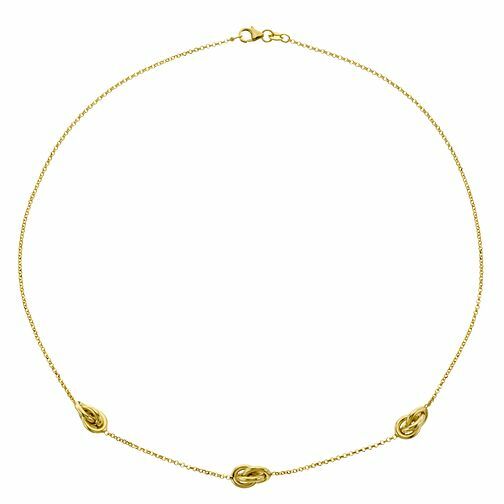 Using the knot symbol as a symbol of the bond between two people, this 9ct Yellow Gold necklet features three knot station accents, with the thinner chain allowing the look to stand out for a distinctly fashion-forward sense of style. 9ct Yellow Gold Knotted Necklet is rated 4.0 out of 5 by 1. Rated 4 out of 5 by Anonymous from NICE NECKLACE VERY PLEASED WITH MY 3 KNOT NECKLACE. CANT WAIT TO WEAR IT. HAVE HAD THE KNOT EARINGS FOR CHRISTMAS SO SHOULD LOOK STUNNING.